WARNING – As noted in the text entitled “The Bad and Not So Bad News,” the writings that preceded that text had not yet been published. Ergo, what we are going to do is “rebobinar” (that is, “rewind” the tape) to what should have appeared on the Day of the Dead. Having rewound, you may then read in inverse order the inverse order in which the texts will appear and that way you will…hmm…forget it, I’ve even managed to confuse myself. The point is that you get the gist of the “retrospective” perspective. It’s as if one is going in one direction but later returns to see how they got going in that direction in the first place. Got it? No? WARNING TO THE WARNING – The following texts do not contain any reference to present, current, important, or pressing situations, nor do they have any political references or implications or anything of the kind. They are “innocent” texts, as are all the writings of the self-designated “Supcomandante of stainless steel” (that is, me). Any resemblance or similarity to real persons or events is purely coincidental and quite frankly schizophrenic…yes, just like the national and international situation where it is clear that…okay, okay, okay, no politics. P.S. Durito’s First Encounter with the Cat-Dog. Durito was solemn; but not with that false posturing of government officials the world over. He was serious in that sense of when one is hit in the face by a heavy loss and there’s nothing one can do about it other than curse…or tell a story. Don Durito of the Lacandón lights his pipe, this errant and wandering knight, comforter of the afflicted, delight of children, unrequited yearning of women and others, unattainable standard for men, nightmare of tyrant and despots, uncomfortable thesis for ignorant sophists. At first glance, the cat-dog looks like a dog…ok, maybe more like a cat…or a dog…until it meows…or a cat…until it barks. The cat-dog is unknown to terrestrial and marine biologists (in which category of living things would it fit? ), an irresolvable case for psychology (neural surgery cannot locate the part of the brain that defines dogness or catness), a mystery for anthropology (can traditions and customs be simultaneously similar and antithetical? ), a source of despair for jurisprudence (what rights and duties emerge from both being and not being? ), and the holy grail of genetic engineering (it is impossible to privatize that elusive DNA). In sum: it is the missing link that would bring down the entire Darwinist laboratory, seminar, symposium, and much-reiterated scientific fashion. But let me tell you what happened. “…Oh, okay, a cat then,” I said tentatively. “Okay, a cat-dog,” I said to him and to myself. “There you go,” he said… or I thought he said. “So well, how’s life?” I asked (and I transcribed without hesitation, determined not to be surprised by anything, since it was a beetle who was dictating this exceptional story to me). “Sometimes it’s worthwhile,” he responded with a kind of purr. “At times it’s like cats and dogs,” he growled. “Is it a problem of identity?” I ask, lighting a pipe and taking out my multi-touch smartphone-tablet (in reality it’s more like a spiral notebook, but Durito wants to appear very modern—transcribers note). “Nah, one doesn’t choose who they are, but rather who they could be,” the cat-dog barked disdainfully. “And life is no more than that complicated transition, achieved or truncated, from one thing to the other,” it added with a meow. “So then, cat or dog?” I asked. “Cat-dog,” he said, as if stating the obvious. “But, how does one avoid ending up in one of the sinister rooms of that grim house of mirrors that is fanaticism? How does one resist the pressure and the blackmail to join in and embrace religious or lay fanaticism,.. the oldest kind, yes, but not the only current one? “It’s simple,” said the cat-dog laconically, “don’t join. Build many houses, each their own. Abandon the fear of difference. Because there is something that is the same as or worse than a religious fanatic, and that is an anti-religious fanatic, or secular fanaticism. And I say that it could be worse because the latter uses reason as an alibi. And, of course, it has its equivalents: homophobia and sexism, phobia of heterosexuality and hembrismo [the assumed moral superiority of women]. And you can add to this the long etcetera of the history of humanity. “Are you saying, my esteemed sir, that those who criticize sports fanatics are just as bad as the sports fanatics? Durito interrupts. “Are you talking about soccer?” Durito asks as he takes out a ball that he himself autographed. “Not only about soccer. In everything, the problem is who commands, the owner, he who makes the rules. “Hmm… it would be very difficult to put this in a tweet,” Durito says as he counts to see if it could fit into 140 characters. “The modern political class is fighting over who will be the pilot of a plane that crashed a long time ago into neoliberal reality,” pronounces the cat-dog, and Durito thanks him with a bow. “So, what is to be done?” asks Durito as he demurely stows his Chiapas Jaguars banner. “And the conclusion?” Durito asks. “Neither dog nor cat. Cat-dog, not at your service. And with that he left, the cat-dog that is, which, as its name indicates, has the disadvantages of both dog and cat… and the advantages of neither (if there are any). Dawn had already come when I heard a sublime mix of meow and bark. It was the cat-dog serenading, out-of-tune, the light of our sweetest dreams. And in some early morning hour, perhaps on a still distant calendar in an uncertain geography, she, the light that both unveils me and keeps me from sleeping, will understand that there were hidden lines, drawn for her, that maybe only then will be revealed or recognized in these words now, and she will know in that moment that it didn’t matter what path my steps tread. Because she was, is, and will be, always, the only worthwhile destination. Postscript: where the Sup tries to explain, in a postmodern multimedia format, the way in which the Zapatistas see and are seen in their own history. Well, first it’s necessary to clarify that for us, our history is not just who we have been, what has happened to us, and what we have done. It is also, and above all, what we want to be and do. Now, in this avalanche of audiovisual media ranging from 4D cinema and LED 4K televisions to the polychrome and multi-touch screens of cell phones (which, allow me the digression, show reality in colors that have nothing to do with reality), we can place, in an improbable timeline, our way of seeing our history with… a kinetoscope. Yes, I know that I went a bit far back, to the origins of cinema, but with the internet and the multiple wikis that abound and redound, you won’t have a problem figuring out what I’m referring to. Sometimes, it can seem like we are getting close to 8 tracks and super 8 tracks, and even then the 16 millimeter format is still far off. What I mean is that our way of explaining our history seems like an image of continuous and repetitive movement, with some variations that give that sense of mobile immobility: always attacked and persecuted, always resisting; always being annihilated, always reappearing. Maybe that’s why the denouncements made by the Zapatista support bases, via their Good Government Councils, have so few readers. It’s as if one had already read that before and they only changed the names and the geographies. Yes, it’s a little like Edison’s moving images from 1894, in his kinetoscope (“Annie Oakley”): we were the coin tossed into the air, while the young lady “civilization” shot at us over and over again (yes, the government would be the servile employee that tossed the coin). Or like in “The Arrival of a Train” from 1895 by the Lumiere brothers; we were the ones who stayed on the platform while the train of progress came and went. At the end of this text you will find some videos that will help you understand this. But now and then the collective that we are takes and makes each still shot, drawing it and painting it as the reality that we were and that we are, many times with the black shades of persecutions and prisons, with the gray shades of contempt, and with the red of plunder and exploitation. But also with the browns and greens of we who are of the earth. When someone from outside stops to look at our “movie,” they often comment: “what a skillful shooter!” Or “what a daring employee who throws the coin into the air without fear of injury!” But no one says anything about the coin. Those who come to be with us, to look at us looking at ourselves, to listen to us, to learn from us in the little school, discover that in each still shot, we Zapatistas have aggregated an image that is not perceptible at first glance. It is as if the apparent movement of the images hides the particular that each still shot contains. That which is not seen in the daily comings and goings is the history that we are. And no smartphone captures those images. Only with a very big heart can they be detected. Of course, there is always someone who comes and tells us that now there are tablets and cellphones with cameras in front and back, with colors more vivid than those of reality, that there are now cameras and printers in the third dimension, that there is plasma, LCD and LED, and representative democracy, and elections, and political parties, and modernity, and progress, and civilization. They tell us that we should leave behind all that stuff about collectivism (which, besides, rhymes with primitivism): that we abandon this obsession with taking care of the environment, the discourse of mother earth, self-organization, autonomy, rebellion, freedom. For the mass (paid) media, they are the modern ones, we are the archaic. They are the civilized, we are the barbarians. They are the ones who work, we the idle. They are the “decent people,” we the pariahs. They the wise, we the ignorant. They are the clean, we are the dirty. They are the beautiful, we are the ugly. They are the good, we are the bad. And they forget what is most fundamental: this is our history, our way of seeing it and of seeing ourselves, our way of thinking ourselves, our way of making our path. It is ours, with our errors, our failures, our colors, our lives, our deaths. It is our freedom. Because when we Zapatistas draw a key below and to the left in each still shot in our movie, we are thinking not about what door to open, but about what house with what door we need to create so that this key will have a purpose and a destiny. And if the soundtrack of this movie has the rhythm of polka-ballad-corrido-ranchera-cumbia-rock-ska-metal-reggae-trova-punk-hip-hop-rap-and-whatever else is added, it’s not because we don’t have musical taste. It’s because this house will have all colors and all sounds. And there will be therefore new gazes and new ears that will understand our efforts… even if we are only silence and shadow in those future worlds. Ergo: we have imagination, they only have plans with terminal options. That’s why their world is crumbling. That’s why ours is resurging, just like that little light that, although small, is not less when embraced by shadow. Vale. Cheers, and here’s to celebrating our birthdays very happily, which is to say, in struggle. El Sup, confusing himself with the videos that he wants to include in order to, as they say, put the candle on the cake that does not say, but knows itself to be, thirty-something. 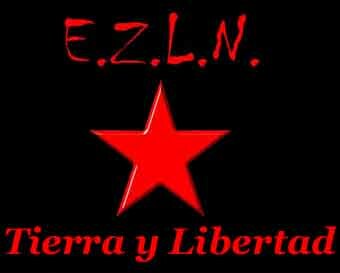 Thirtieth anniversary of the EZLN. A cat-dog in action. Note how he returns to his secret identity when he is discovered. A very brief reference to the origin of cinema. Pay attention to the mini-short: “Annie Oakley,” seconds 20 through 26.